Hello and Happy New Year WarBirdBabe Followers! We thought you might like to see our viewer statistics for 2010. I thought they were interesting and encouraging since we’re a “one gal show” at this point – with lots of room for expanding our photo galleries and stories. We would love to hear your thoughts about the blog, perhaps suggest some interviews you’d like to see in the future, or request postings of your favorite War Bird Aircraft and last, but not least, storey topics you’d like covered. We’d also like to post your interesting photos of War Bird Aircraft or Military Service Men and Women. All we need is an accurate description of who, what, where and when … and, if you don’t have all the details, perhaps one of our WarBirdBabe followers may have the answers you need! Currently we’re editing a fantastic two-hour interview with Bob Hoover where he discusses the humble beginnings of the Reno National Championship Air Races and his current business venture. Another video will air this year with Jet Pilot Curt Brown and Journalist Guy Clifton of the Reno Gazette. We’ll also be posting more than 500 photos throughout the year from the recent Air Races and are in the process of accumulating photos from the archives of fans whose parents and/or grandparents served in WWII as Bomber Pilots and/or Crew. Many thanks to all who have provided interviews and to those who have visited the WarBirdBabe blog and have taken the time to make comments in 2010 – we appreciate that very much. We hope to see you again and again in 2011 and look forward to providing an outstanding War Bird Aviation site – one worth telling your aviation friends about and visiting often! A Boeing 747-400 passenger jet can hold 416 passengers. This blog was viewed about 3,200 times in 2010. That’s about 8 full 747s. In 2010, there were 20 new posts, growing the total archive of this blog to 29 posts. There were 107 pictures uploaded, taking up a total of 4gb. That’s about 2 pictures per week. The busiest day of the year was September 20th with 136 views. The most popular post that day was Photo Gallery from Photog Jim Loveless. The top referring sites in 2010 were indytransponder.blogspot.com, facebook.com, bayarearidersforum.com, en.wordpress.com, and mail.yahoo.com. Some visitors came searching, mostly for heather penney, blue angels, steve hinton jr, rare bear, and tom aberle phantom. On Saturday – the last big day of racing at Reno this year, I snagged a moment of Mrs. Penney’s time while her Husband John Penney was visiting his favorite fans in Section 3. John Penney being the accessible pilot for which he’s known, takes time each year to personally meet and greet the loyal race fans of Section 3. You can see some love for the fans in the background of this video interview. Even though the gregarious Pilot John Penney shakes hands with all other pilots, RARA officials, Pace Pilot Steve Hinton Sr., the friends, crew and some long-time photographers with whom he’s made friends; Stephanie is always the last person to touch her husband before he enters the cockpit of the Rare Bear. I so admire passion when I see it in others. Observing only a small sliver of time, I’ve witnessed the mother load of passion in the Penney family. I’ve seen a quiet ritual between them for many years. With a small kiss and a few spoken words, they share a confirmation of knowing the inherent risks and potential dangers in the next flight. And in so knowing, choose to embrace the shared passion of flying with a meaningful moment of understanding, support and affirmation of what is most important: each other. So there is my inspiration for wanting to talk with Stephanie Penney. Now that she has two members of her family flying, I thought it would be interesting to learn how she copes with the stress, if any, and see if there really are rituals that keep the family strong. Thank you for sharing your thoughts with us Stephanie! Good Luck and God’s Speed to the Flying Penney’s! George Andre is a fun-loving, serious pilot whom I throughly enjoyed talking with early in the week at Reno. George is the oldest pilot racing in any of the six classes presented at the Reno Air Races and most likely is one of only a handful of men racing who have flown, within the earths atmosphere, at +2,200 mph – about mach 2.2. George has quite a collection of aircraft experiences, knowledge and skill under his belt and still yearns to fly the fast-moving jets screaming overhead throughout the week – like the screeching F-18 heard during this interview. George, a former fighter pilot, flew one of his favorite aircraft of all, an F-86 while in the service. Other aircraft included the F104, F101 Voodoo, and George – a man of skill and nerves of steel, was a test pilot for the F104 Starfighter (a rocket with wings…also capable of mach 2.4). In 1960 George worked for Lockheed as a Test Pilot and then moved on to Skunk Works where he worked with aeronautical genius Kelly Johnson and as a Flight Test Engineer racking up over 55 hours of flight time in the SR-71. (Did you know the SR-71 flew at an altitude of over 85,000 feet?!) Listen to his description of what the earth looks like from that height and the incredible speed he flew. George is honored to have been inducted into the Mach 3 Club as its 16th member by Kelly Johnson. 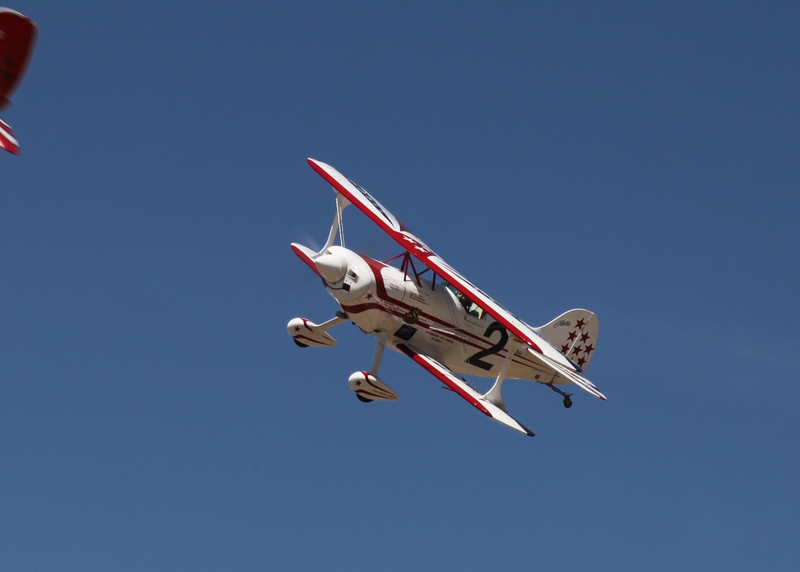 What incredible aviation experiences this man possesses- and he’s here, flying a Bi-plane in the Reno Races. Thanks to the windy weather and two unfortunate accidents, the 2010 Reno National Championship Air Races ended in disappointment for those waiting for the big T-6 and Unlimited Class races on Sunday. This is the first time in 47 years (baring 9/11/01) that the Gold Race for the T-6 and Unlimited Classes were cancelled. With the emergency support staff stretched at both ends of the field and gusty winds blowing up to 29 mph, the limit being 30 for take off, the core group of pilots decided to stand down for 30 minutes and see if conditions would improve. Sadly, the winds continued to howl. The final Gold Races for the T-6 and Unlimited Classes were called off officially by Reno Air Race Association CEO and President Mike Houghton mostly for safety reasons. In those windy conditions, only runway 26 was be available for landing. In the event of a may-day, runway 26 would be out of commission leaving those in the air with limited fuel and options for landing. Not a good scenario. So the awards went to the winners of Saturday’s races. Steve Hinton Jr. took the Gold in the Unlimited Class, making this his second win in Race 7 Strega, and Dennis Buehn brought home is 1st Place Trophy for in the T-6 Gold race in his beautiful Race 43, Midnight Miss III . The Jet Class was able to race their Gold event and pilot Curt Brown, flying Race 77, Viper with a posted speed of 515.582 , blasted in to first place, passing Mike Mangold in Race 12, Euro Burner. Do we need an introduction for the newest female Jet pilot on the block? Yes we do – the fans were delighted to see the aviation abilities of newbie Heather Penney, Pilot of Race 21 Raju Grace, a beautifully painted L-29. Her father, John Penney flies Rare Bear Race 77 a Grumman F8F Bearcat. Look for an interview with Heather and learn about her aviation career as an F-16 pilot in the 121st Fighter Squadron, Air National Guard, in Washington D.C. The Super Sport class has and incredible story of survival this year. Pilot George Giboney had a may-day in his Thunder Mustang, Rapid Travel, Race 75 and safely landed near the runway. Unfortunately, just when he thought the worst was over, his lightweight checker-board painted aircraft hit a swale in the dirt and tumbled nose over end, loosing the engine to the left (barely missing him inside his canopy); both the wings snapped off with the fuel spraying into the air like a water balloon and tail departing. Miraculously, when what was left of his aircraft came to rest, George was sitting upright in his chair, seatbelts on and canopy gone. What a ride from which to walk away… God has surely blessed this pilot. Pilot Gary Davis flying a Cassutt, Race 40 named Miss USA had a wind related accident on the runway just as his class was in formation and taking off. The wind blew hard enough to tip him on his nose thus ending the race for him. Fortunately there were no other planes on his tail that got too close. So this is only a summary of events at the 2010 Races. SR-71 Test Pilot George Andre; Heather Penney, Pilot Jet Class; Bill “Tiger” Destefani, Owner Race 7 Strega; Chris Rushing Pilot T-6 Race 42 Honest Entry; Mrs. John Penney & Section 3; Dan Martin Pilot P-51 Ridge Runner; Rick Martin – President of the Van Nuys Flying Condors; Curt Brown and my friend and favorite – Bob Hoover, Living Legend, Test Pilot, Pilot, Aviation Pioneer.